Top class volleyball action comes to Queensferry on Saturday. All roads lead to Queensferry High School on Saturday for a showdown between the Scottish Volleyball Premier League’s top teams. 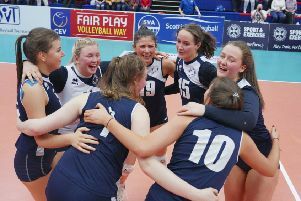 City of Edinburgh Volleyball, who train and play in South Queensferry, are undefeated this season in both the men’s and women’s volleyball Scottish Premier League. And on Saturday they are hoping for a record attendance to see both men and the women face their only other undefeated opponents, Su Ragazzi, in matches that are likely to go a long way to decide the winners of the 2016-2017 Premier League. The men’s first team have yet to drop a set this season and will be looking for a boost ahead of their home and away matches with Norwegian side Viking TIF Bergen in their first ever European Cup campaign. Meanwhile in the women’s Premier League both City of Edinburgh and Su Ragazzi have sailed through this season without dropping a set! Last year City of Edinburgh women won the SVA Scottish Cup while Su Ragazzi won the Scottish Volleyball Premier League. So there are more than a few scores to settle.